This year is the centenary of the extinction of the Passenger Pigeon and also of the death of John Muir – ‘the Scotsman who saved America’s wild places’. John Muir was born in Dunbar in 1838 and died in California in 1914 – in between he fell in love with the USA’s wildlife and wild places and he did a lot to protect them. He was an amazing man and this book does him justice. I knew a bit about John Muir before I started researching and writing about Passenger Pigeon’s but his name came up a lot in my studies and I wondered whether someone was writing a book about his life at the same time that I was writing about that of Martha and other Passenger Pigeons. Little, in fact nothing, did I know that Mary Colwell, Guest Blogger here, and one of the producers of the BBC Radio 4 programme, Shared Planet, was scribbling away too. Hers is a sympathetic biography of one of the most important characters in American and world nature conservation. Muir was not the only man who pressed for America’s wildernesses to be protected, but his writings influenced many others to support the idea of National Parks. Wallace Stegner called national parks “the best idea we ever had. Absolutely American, absolutely democratic, they reflect us at our best rather than our worst.” and there is a lot of truth in that, except that it was this Scot, with a hard upbringing, who worked as a labourer, assistant shepherd and as a horticulturist, who was one of its main proponents. Muir was a Christian, and a kind one it seems. He believed that we should protect nature for its own sake rather than as a wise investment in a resource that we might want to harvest in future. This is a debate that goes on today – Muir might not be too keen on a heavy reliance on the ‘ecosystem services’ approach. He argued against the flooding of the Hetch-Hetchy Valley in the Sierra Nevada, and near to, and apparently just as beautiful as, his beloved Yosemite Valley. But if you go to Hetch-Hetchy today you will see it is dammed and its water supplies a distant San Francisco. That was a battle that Muir lost, although the Sierra Club still maintains its policy that the valley should be restored to wilderness. Muir was a character and he had character; he was simple and complicated; he was a loner and a great communicator. This book will appeal to you if you are interested in the origins of nature conservation, the rationale for protecting nature and if you share Muir’s love of wilderness. But the story of his life is an interesting one even without that context. 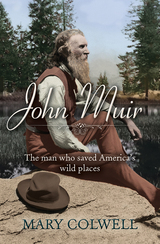 John Muir – the Scotsman who saved America’s wild places, by Mary Colwell, is published by Lion Hudson later this week) and the paperback is very good value. A Message from Martha by Mark Avery is published by Bloomsbury. One of my all-time heroes Mark. His 'A Thousand-Mile Walk to the Gulf' is one hell of a travelogue. He is still more famous in the USA than in Scotland but thanks to the great work by many people his name is certainly better recognised now than ever before. If you find yourself in East Lothian then a visit to the 'John Muir Museum' in Dunbar is a must.